A celebration of 101 of the world's most unheralded fright flicks from FANGORIA MAGAZINE. In depth reviews and information of little talked about modern horror films that were overlooked by most people. Photos. Softcover Over 270 pages. Softcover book. By Bryan Senn. 698 Pages (in two volumes). CLICK IMAGE FOR DETAILS. Mini bios with photos of the directors and their films. All the great horror directors: Tod Browning, James Whale, Roland West, Jacques Tourneur, Roger Corman, controversial silent director Benjamin Christensen, Jack Arnold and many more. Oversize large softcover. 1069 page book. An encyclopedia on films and film stars. A reference book that contains over 6,000 entries. Foreward by Alfred Hitchcock. This is the June 1971 edition (Third edition, revised and expanded). Used with some wear. Details the films and life of Boris Karloff. All of Karloff's films are covered from the early silent days through the 30s, and his ensuing stardom as the greatest of all horror actors. Rare photographs and anecdotes. Slight dust jacket shelf wear. 1974 First Edition. By Roy Kinard. Widely acclaimed as a horror movie actress, Fay Wray is best remembered for her performances in King Kong. Wray appeared in 77 feature films between 1925 and 1958. CLICK IMAGE FOR DETAILS. Films such as The Naked Witch, Zontar, The Thing From Venus and Mars Needs Women have gained large cult followings, and movies like A Bullet For Pretty Boy, Free, White and 21 and Goodbye, Norma Jean became box office hits. Click image for details. By Sam Arkoff. Funny, knowledgeable, informative and just as downright entertaining. Well written, with many anecdotes about the history of AIP. Don't miss this. It's like taking a walk with a great friend. New with dust jacket in protective library sleeve. Lots of photos too! A boy from another planet through a different dimension. Classic young reader science fiction from Scholastic Books! By Alexander Key, illustrated by Dom Lupo. Great stuff. Name in marker on cover, but books appears unread with tight spine and no interior markings. The original Universal script for FRANKENSTEIN (1931) that was to be directed by Robert Florey and stat Bela Lugosi as the Frankenstein Monster. Dramatically different. Includes an amazing letter reproduced from Florey regarding the Lugosi screen test and make-up. A super collectible! The book alone is highly sought after....the over-sized hardback edition of Mary Shelley's novel. Beautifully illustrated by iconic artist Berni Wrightson. Dust jacket and in very good condition! The classic Mary Shelley novel with beautiful wood engraved illustrations. It's a hardback issued in 1988. Dust jacket included and the book appears unread and in great shape. Wood gravings by Lynd Ward. A large softcover that goes scene by scene, telling FRANKENSTEIN (1931) in still photographs. Hundreds of stills to study and frame blow-ups from the Boris Karloff classic. Issued in 1974. Amazing book. Condition: cover and spine wear, but all pages intact. 256 pages. Mary Shelley unabridged classic. 1968 Lancer paperback edition. Appear unread! Very slight crease in top right corner. Old bookstore sticker (small) on inside front cover. Very nice! Boris Karloff monster painting on cover. For the FRANKENSTEIN collector, a wonderfully illustrated edition of the Mary Shelley classic. More than 100 illustration by Robert Andrew Parker, pen and ink washes and watercolor. 1976 hardback edition. Note: Former library book. Usual markings and wear. But intact! Comic book styled graphic novel of Universal's movie FRANKENSTEIN (1931). Beautiful artwork and loyal adaptation of the classic film by Den Beauvais. 1993, new. By Donald F. Glut. A book sewn-together of cool Frankenstein facts and studies. CLICK IMAGE FOR DETAILS. An ideal reference to all Frankenstein films and Frankenstein monster appearances. Illustrated with color and black and white photos. Beautiful quality stock paper and great reference. Introduction by Boris Karloff. A really great book. Another of the Magic Image books by Philip Reiley. This one unearths the original stage script by John Balderston and Garret Ford. The movie in 1931 used this as a template for the film, although it dramatically differs. Amazing for all students of Frankenstein! The history and fun of WOR-TV, Channel 9 out of New York. 1973-1987. 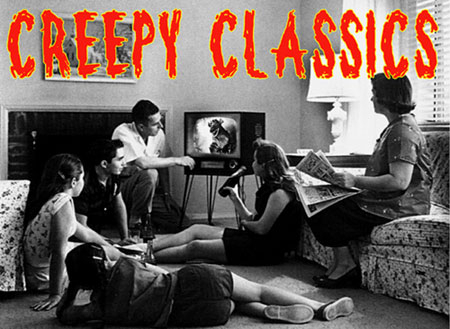 The horror films and how they were presented to a generation of monster movie lovers. Author James Arena provides a heartfelt look with a serious study of this great independent TV station's presentations. Hardback, first edition with dust jacket - new. Ray Bradbury, America's most beloved storyteller, has spent a lifetime carrying readers to exhilarating and dangerous places. Now he takes us to a most wondrous destination: into the heart of a very strange family. By Jules Verne! A vintage Scholastic book from 1969. The original science fiction novel by Verne. Some cover wear. No pen markings. A classic Scholastic! By G.M. Goodwin. A book of fiction that brings back all your favorite classic monsters into present day! It merges WEREWOLF OF LONDON with ABBOTT AND COSTELLO MEET FRANKENSTEIN, then sets the action around a convention of film fans like MONSTER BASH! Click image for more.